OVERVIEW: The Kendricks help make the problems of the Washington elite disappear…but some secrets won’t stay buried. 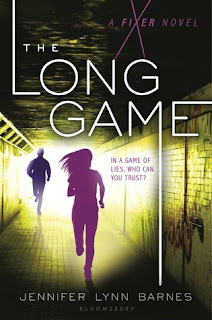 FORMAT: The Long Game is the sequel to The Fixer. It is a contemporary YA political thriller. It stands at 360 pages and was published June 7, 2016 by Bloomsbury US Childrens. ANALYSIS: Last year, The Fixer was a surprise find. It was thrilling, exciting, fast-paced and left me totally speechless. In fact, it was one of my favorite novels of 2015 even though it was technically a political thriller and not a genre I tend to gravitate towards. The Long Game is the long awaited sequel to The Fixer and it doesn't disappoint. The Long Game starts with Tess being asked to help one of her fellow students run for student body president. This seemingly normal task is further complicated when an inappropriate photo appears of the candidate and Tess is left to sort out who took the photo, how it came to light, and whether or not it is real or a setup to get rid of the individual running for student body president. While Tess is trying to lead a seemingly normal life as a teenager, other more complex issues start to arise. An attempted terrorist attack occurs at the local hospital and it appears as if Tess's guardian is in the midst of the scandal. Tess tries to stay out of it, but she gets dragged further and further into the complex world of politics when it appears as if her guardian is investigating a dangerous terrorist organization. What follows is a tale of political intrigue, mystery, and intense action. The Long Game is very similar to The Fixer. The writing style of Jennifer Lynn Barnes makes it extremely easy to just jump into the novel and feel totally immersed. Even though it had been over a year since the first novel was published, it didn't feel like things missed a beat. It was really easy to catch up on past event (just enough info is provided to refresh your memory but not drag down the story) while also instantly connecting with the characters. Jennifer Lynn Barnes does an amazing job – again – of creating a detailed political thriller. It wasn't so complex that readers got confused, but it wasn't overly predictable. There were plenty of times where I wasn't 100% certain where the story was going and just went along for the ride. After reading close to 200 books a year, it is hard to find books that are unpredictable, this one was. One of the things that I liked about The Long Game was the opportunity to explore the relationship between Tess and her guardian. The Fixer introduced a lot of elements that complicated the relationship, but it wasn't really explored. The Long Game allowed readers to explore the relationship a little closer and get a better understanding of how Tess and her guardian interact, where things stand, and how they feel for each other. I loved The Long Game. Things are a bit uncertain at the moment whether there will be a third book in the series, but I truly believe there is room for one. I would welcome a third book. If you are looking for a fast-paced, action packed, well-thought out political thriller, The Long Game is the book for you. It is, in many ways, even better than the first novel – The Fixer.